This 200 large piece jigsaw is designed by Jane Maday and measures 38cm x 48cm. 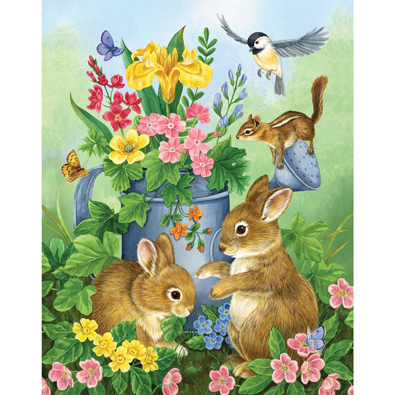 A group of critters gather around a watering can full of flowers. This 200 large piece jigsaw is designed by Adrian Chesterman and measures 15" x 19". Available in two piece count. This 200 large piece jigsaw puzzle is designed by PD Moreno and measures 38cm x 48cm. These friendly jungle animals are smiling at for from a waterfall!